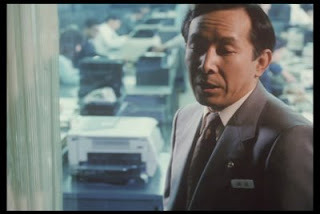 It takes a special type of talent to turn a tax auditing bureaucrat into a charismatic supercop lead, but trust director Juzo Itami to pull it off. 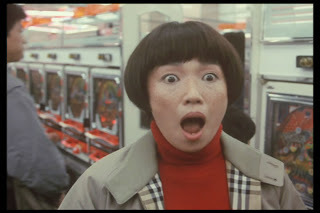 “A Taxing Woman” (1987) was his third film and is instantly recognizable to fans of the director: it wears a charming grin, stars his wife Nobuko Miyamoto and skips along with understated cleverness and comedic ease. The result feels much like a hybrid of “Out of Sight” (1998) and “Ikiru” (1952), gently tuned by Itami’s particular camerawork and staging. 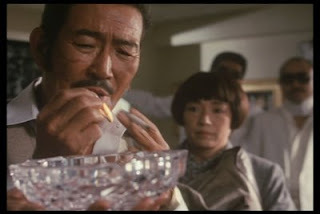 “A Taxing Woman” begins with an extended opening montage in which Hideki Gondo (Tsutomu Yamazaki) exploits every trick he can think of to evade taxes, from tucking away profits in a secret vault to paying off nurses to seduce patients into signing off on dummy corporations that can be used for laundering his money. 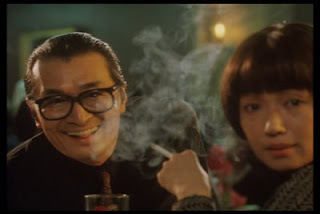 Gondo is a sly and slippery businessman who runs love hotels, cooperates with the criminal underworld, sleeps with a bevy of mistresses and enjoys threading tax loopholes just for art’s sake. For all that, he’s a strangely compelling figure, a concerned father and a man driven more by gamesmanship than malice or even greed. Cue the title screen. Enter Ryoko Itakura (Nobuko Miyamoto). We see her sitting at a café table watching transactions at the cash register, counting digits on receipts and observing the part time help. In her mind she reconstructs their entire business and sees through their every yen-pinching scam. They’re not even worthy opponents for Ryoko, who’s long been distinguished as a peerless tax agent on the fast track for a promotion to inspector. Her freckled face, persistent cowlick and unglamorous attire belie her intelligence, acumen and diligence. She may be the best mid-level government bureaucrat the screen has ever seen. In truth, her adherence to the strict letter of the law may go a little too far, as in her unsympathetic demand that a small family-run restaurant pay taxes on the food they eat themselves. After all, she points out, since the store is recently incorporated, their free meals might as well be stealing. Though she’s usually immune to the puling, pleading and bribing of her quarries, their bitter accusation that the government fails to go after “the real criminals” hits home. After passing by a ritzy love hotel and the luxury cars parked in its garage, she sets her sights on the manager: Hideki Gondo. 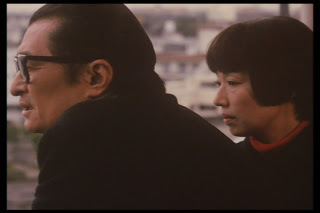 Ryoko and Mr. Gondo’s showdown makes for a modern classic of rivalry romance, with the two quite opposite personalities developing a level of mutual respect for each other than threatens to become an emotional attachment. 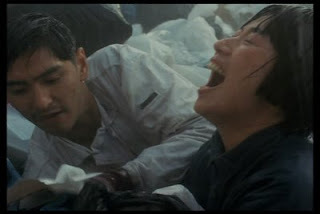 Even as the gloves come off, with Ryoko digging through Gondo’s trash in the rain and Gondo’s goons rousing public enmity towards taxation, there’s still a sense that they’re not just trying to win; they’re trying to impress each other. But Itami never takes the romance too far, allowing his characters to maintain their distinctive dignity while delivering a satisfying and even touching conclusion. The secret of Itami’s success may be that he’s found a way to make a cop/crook thriller that masks a screwball comedy that masks a dark satire. The film feels like it’s heavily plot driven, and we’re given scene after scene of well-constructed thrusts of parries to reinforce this notion, but beneath the intricate financial technicalities and incomprehensible tax codes, it’s really our unexpectedly magnetic leads that make us care. Like most Itami characters, Gondo is a villain we have trouble truly hating. The film seems torn between trying to show how corrupt he is and then talking us out of condemning him, a split-personality tone that actually describes him quite nicely. At one point Ryoko astutely points out that he’s really a dreamer (as evidenced by his delirious themed hotel rooms) and several slips expose his as a bit of a misguided romantic. 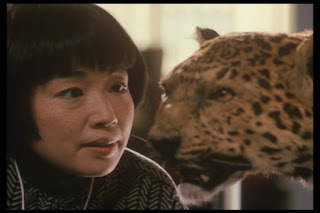 Ryoko, for her part, may demonstrate a methodical tenacity that is borderline excessive and exhausting just to watch (consider the title as pun), but reveals a maternal compassion that gives us a glimpse of a personal life almost rarely mentioned and, perhaps, only rarely lived. Yet her uncomplicated motivation in carrying out law and justice in her own sometimes small way is refreshingly free from Freudian baggage, not to mention avenging-my-dead-partner/friend/family backstories and pro-government propaganda. “A Taxing Woman” couches a social message that warns us of plummeting integrity and widespread greed, but Itami knows that he’s making a comedy and not a polemic. In keeping with this, his camerawork focuses on the minutia of interpersonal tension – sometimes just the nonverbal play of casual gestures, expressive looks and slightly silly gaits – more so than action, violence or seedy atmosphere. Itami’s sense of humor isn’t exactly subtle, but it also isn’t loud in the sense of discrete setups and pithy lines. He has a knack for simply depicting things in a way that brings out their amusing side, often times through Tati-esque choreography. 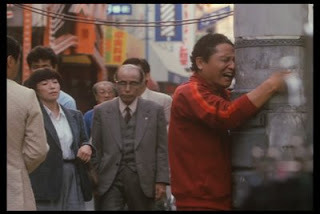 I don’t think “A Taxing Woman” is quite as funny or original as Itami’s better-known “Tampopo” (1985), but the director makes better use of Tokyo, diving in and out of a buzzing metropolis defined more by its crowds than its architecture. 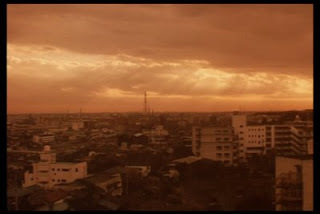 It’s a city Itami depicts as burdened by too many minor corruptions for every crook to be collared, but not plagued by the type of big ticket crimes that would compromise his underlying optimism. Always a fan of packing the frame and staging in depth, Itami makes good use of the real estate in his tight TV aspect ratio. It leads him into busy compositions, but “A Taxing Woman’s” Tokyo is a pathologically busy place, where efficiency is highly valued by both sides. 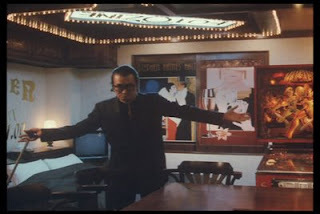 The director’s thick, much-layered conjunctions of staging, composition and performances (Ryoko always hovering, Gondo always leaning forward from his limp), gives a tangible expression to Ryoko’s relentless closing in and Gondo’s bucking to riposte. Katie and I disagreed about the upbeat rubbery jazz theme, which she seemed to consider garish 80’s trash. I rather liked it, though I’m not sure what defense I can offer. It’s repeated too often and doesn’t spin off far enough to get interesting, but somehow it captures the spirit of both Gondo’s cheek and Ryoko’s pluck. Juzo Itami is pretty much a style and movement unto himself, a light-hearted, more compassionate voice than is found in most Japanese films from the last decade and a half. You owe it to yourself to see at least “Tampopo” or “A Taxing Woman,” if you haven’t already. I’ve found myself surprised that Itami’s entire filmography is not more readily available, but I’ve reaffirmed my interest in tracking down more of his work even if Netflix can’t help me. 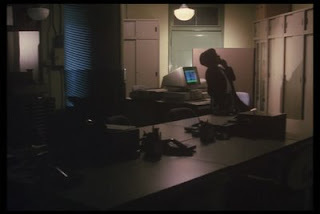 Many consider his only sequel, “A Taxing Woman Returns” (1988), at least as good as the original, and that might be the direction I head next. I'm curious if the Japanese title has the same pun as the English one.